The listing agent markets your home but rarely brings a buyer that will buy your home. There are thousands of Realtors in Palm Beach County and its these other agents that will actually sell your home based on information they see in the MLS. It is these agents you must keep motivated. The Multi-List Service is a database that only licensed members of the National Association of Realtors have full access too. The database contains all the details about every home for sale. In a traditional office the listing broker normally sets a minimum sales commission. This sales commission is normally split equally between the Realtor that sells the home and the Listing Agent. A Comparative Market Analysis provides you with an opinion of your homes value based on previous sales, current listings and expired listings. Call us, email us or contact us today for more details. 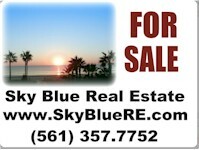 We are licensed Florida Real Estate Agents. Our license requires us to follow the strict Realtor code of ethics use our services with confidence. Extensive Web Presence and Marketing including You Tube. 9. We will disclose all known facts that materially affect the value of property and are not readily observable. All listings are listed on the Palm Beach County MLS and are offered with the Smart Seller Option which allows you to reduce the fee if you provide the buyer.